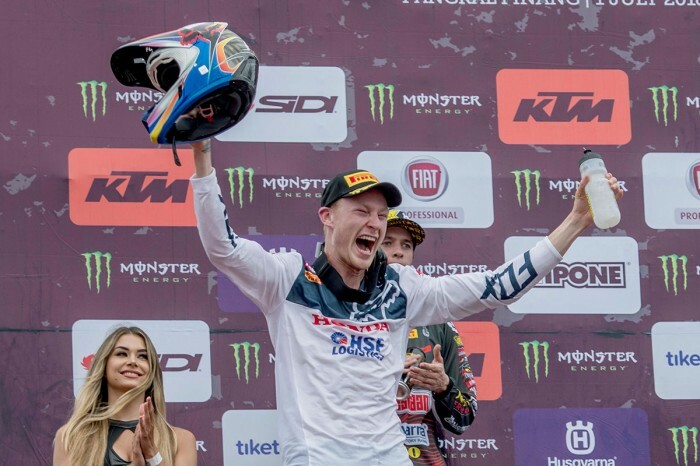 Team HRC’s Calvin Vlaanderen shocked the MX2 field at the MXGP of Indonesia when he raced to overall victory and kept the Red Bull KTM team from the top step of the podium for only the second time this season. A solid sixth in Saturday’s qualification race, the 21-year-old South African ran second for most of the first race but appeared to fade in the hot and humid conditions and was pushed back to third in the closing laps. In race two he came out swinging and after taking the holeshot he out-paced the field to win by just over six seconds. The result gave him career-first race and overall victories and marked Honda’s return to the top step of the MX2 podium following a three-year absence. “I wasn’t expecting this win,” he said. “In race one I got a good start and was second for most of the race but then kind of blew the last few minutes and got passed. Third place was not bad but before the second moto I was fired up. “I told one of the mechanics that I felt like a holeshot was coming and it happened! When you have a clear track ahead you can take the lines you prefer and do your own thing. It’s such a cool feeling to cross the line in first place and to win the first GP is unbelievable.